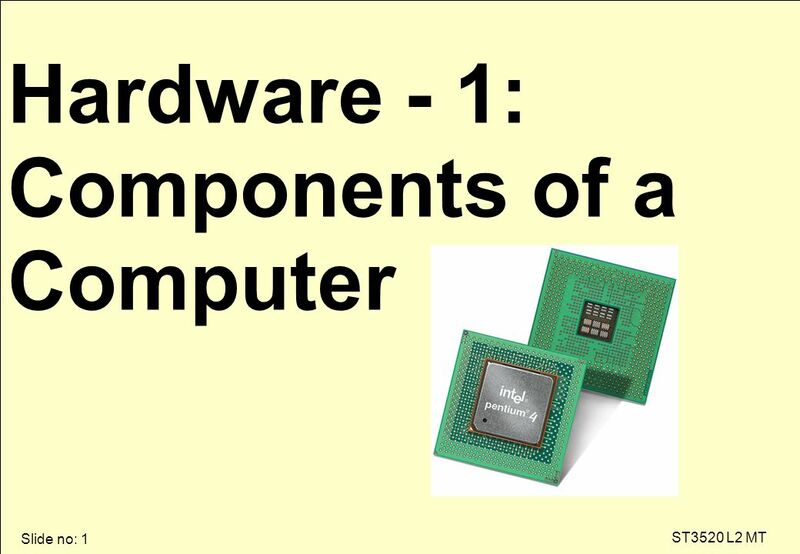 Slide no: 1 ST3520 L2 MT Hardware - 1: Components of a Computer. 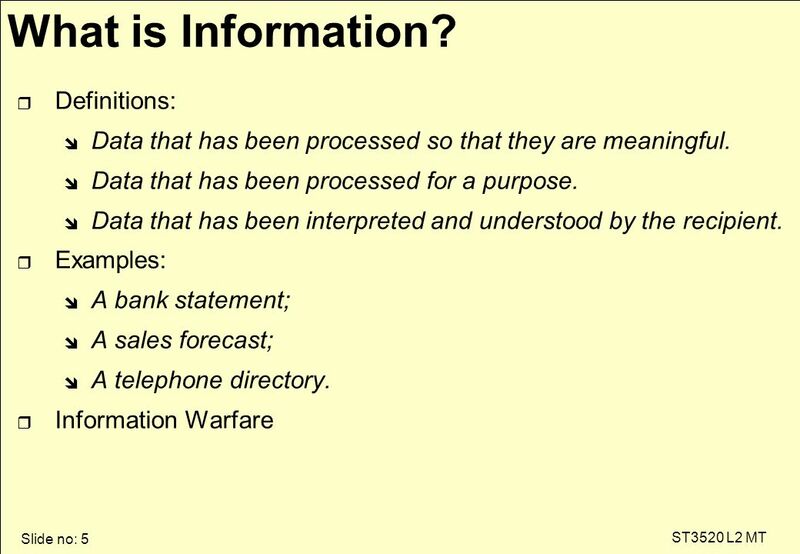 4 Slide no: 4 ST3520 L2 MT What is Data? r Definitions: î A series of non-random symbols, number, values or words. 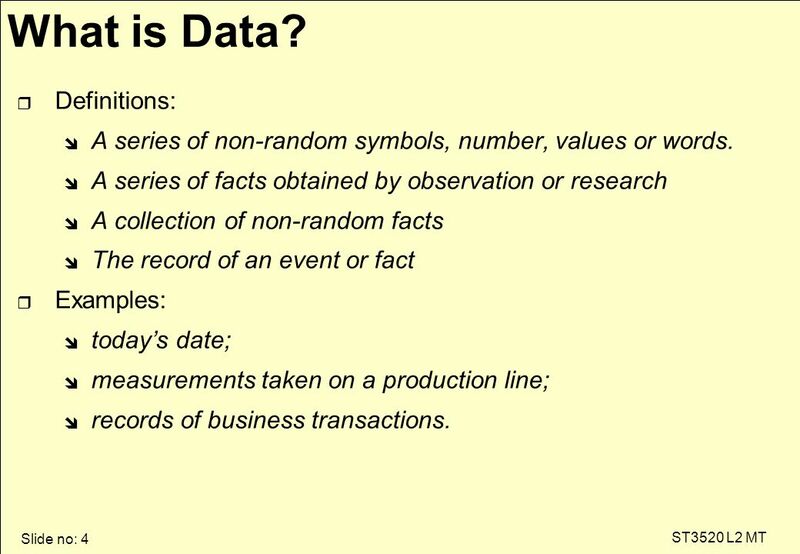 î A series of facts obtained by observation or research î A collection of non-random facts î The record of an event or fact r Examples: î today’s date; î measurements taken on a production line; î records of business transactions. 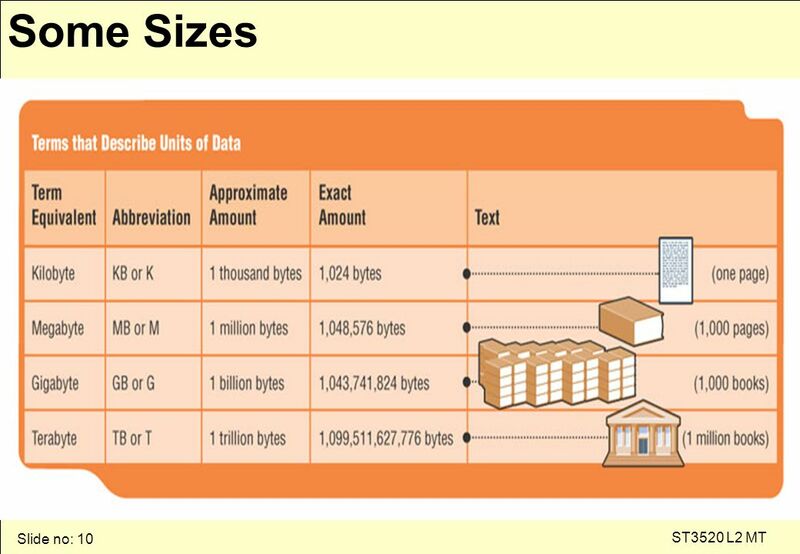 9 Slide no: 9 ST3520 L2 MT How Computers Represent Data r Bit r Byte r Size is normally expressed in Bytes r Standard measures are: î 1,024 bytes = 1 kilobyte (KB) (1,024 = 2 x2 x 2 x2 x 2 x 2 x 2 x2 x 2 x2) î 1,024 KB = 1 Megabyte (MB) î 1,024 MB = 1 Gigabyte (GB) î 1,024 GB = 1 Terabyte (TB) î 1,024 TB = 1 Petabyte (PB) î 1,024 PB = 1 Exabyte (EB) î 1 EB is approximately 1,000,000,000,000,000,000 bytes. 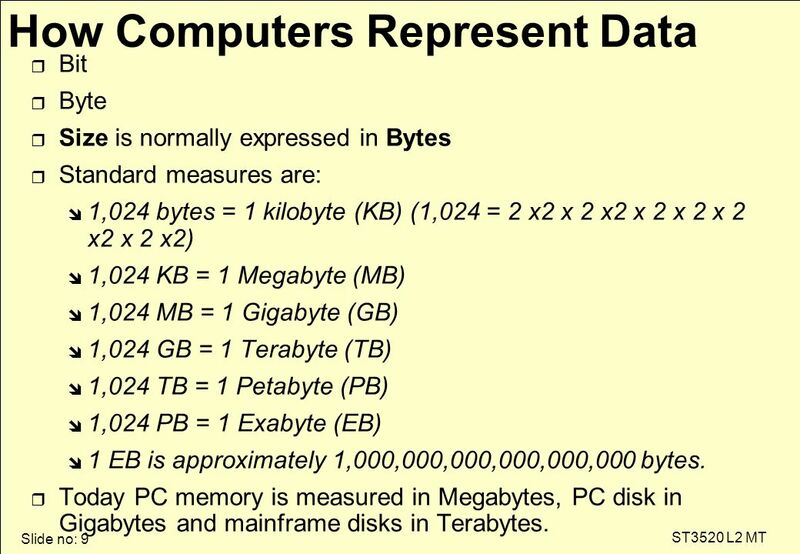 r Today PC memory is measured in Megabytes, PC disk in Gigabytes and mainframe disks in Terabytes. 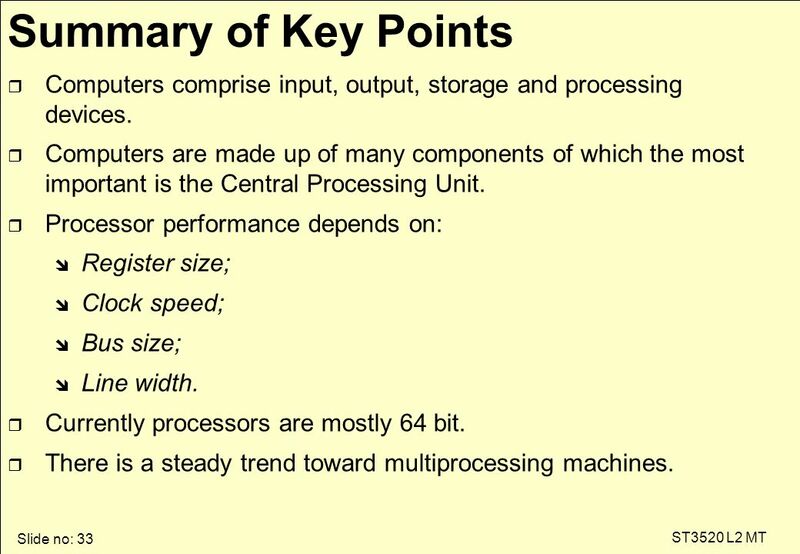 11 Slide no: 11 ST3520 L2 MT However... r When talking of: î Processors (CPU) and î Communications use bit. 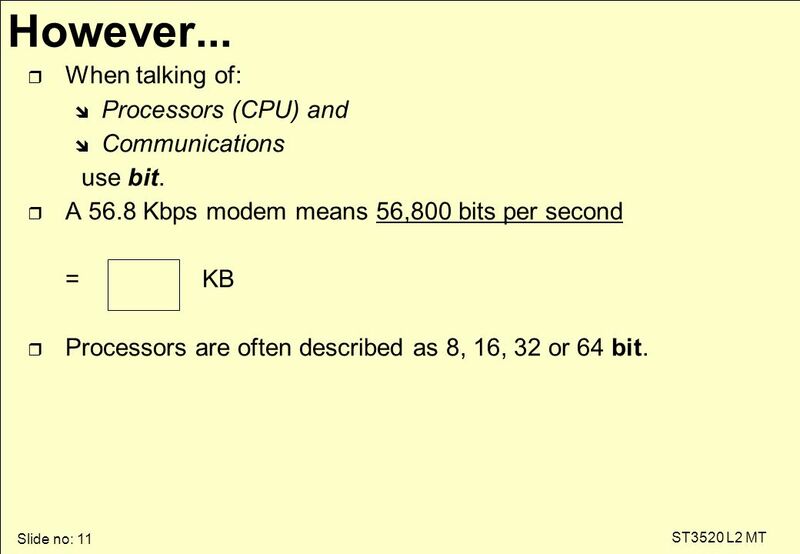 r A 56.8 Kbps modem means 56,800 bits per second = KB r Processors are often described as 8, 16, 32 or 64 bit. 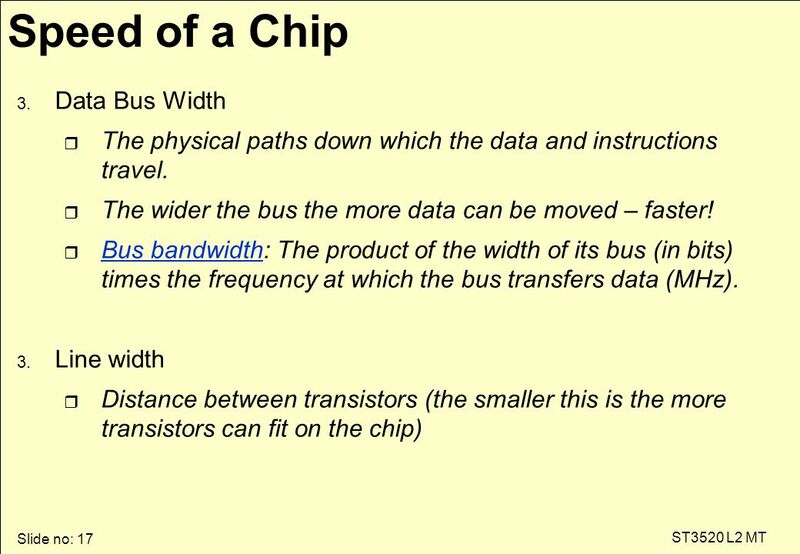 16 Slide no: 16 ST3520 L2 MT Speed of a Chip 1. 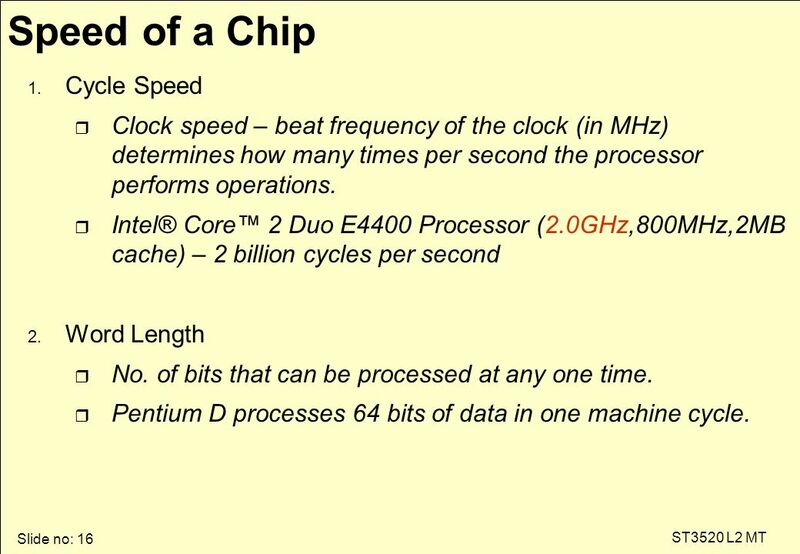 Cycle Speed r Clock speed – beat frequency of the clock (in MHz) determines how many times per second the processor performs operations. 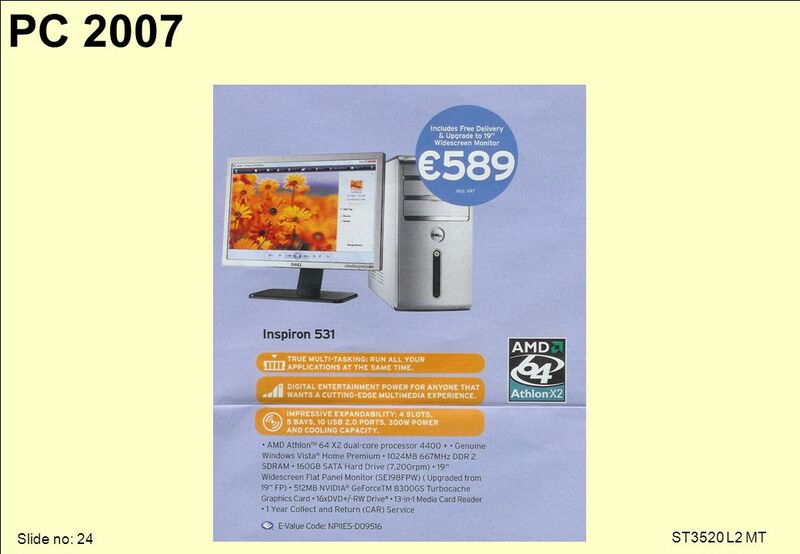 r Intel® Core™ 2 Duo E4400 Processor (2.0GHz,800MHz,2MB cache) – 2 billion cycles per second 2. 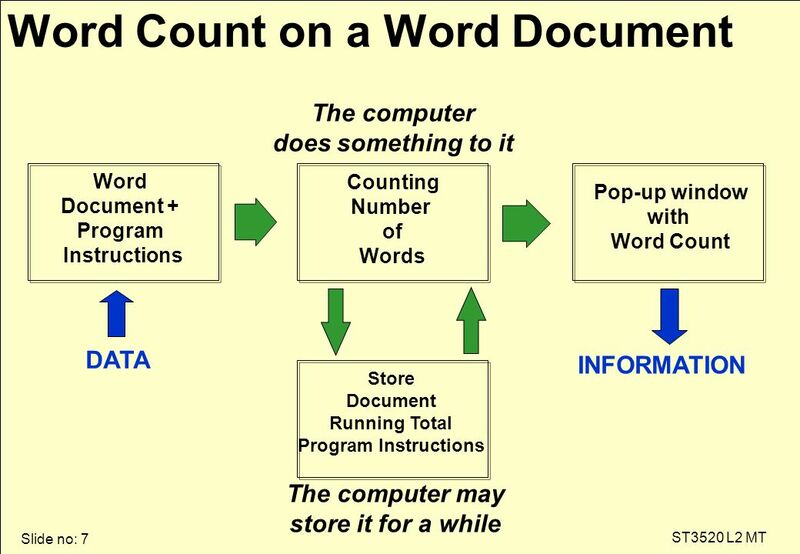 Word Length r No. 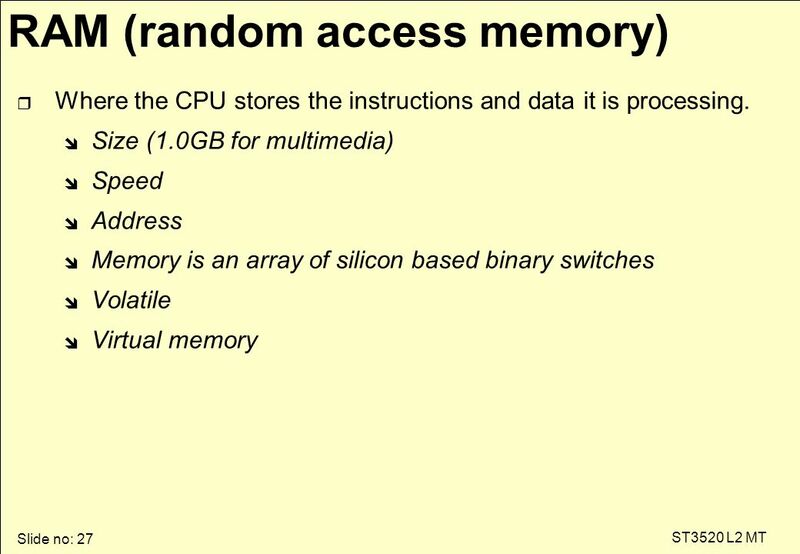 of bits that can be processed at any one time. 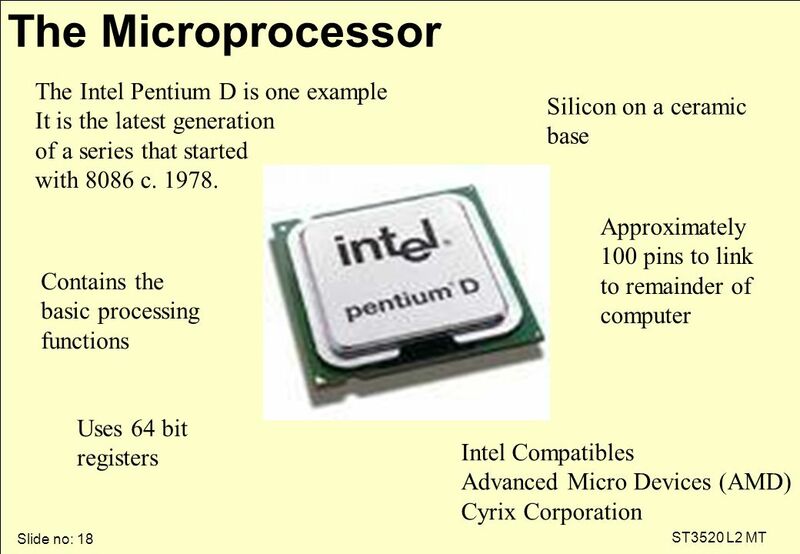 r Pentium D processes 64 bits of data in one machine cycle. 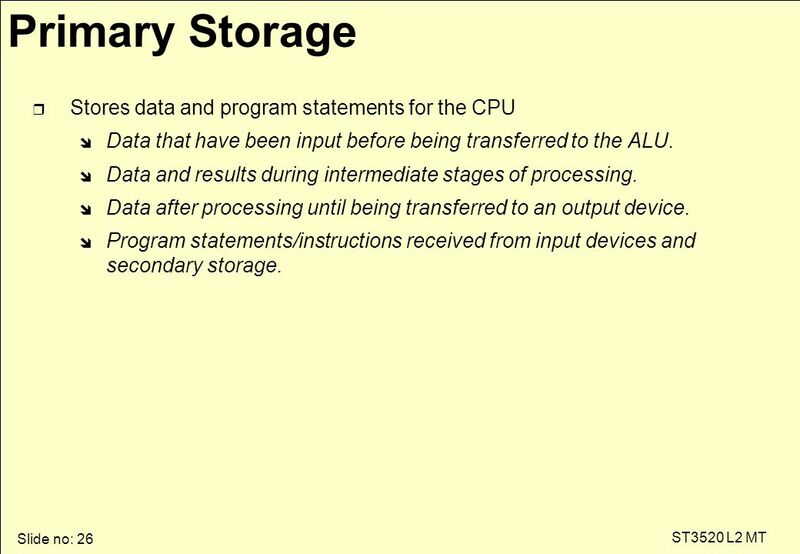 26 Slide no: 26 ST3520 L2 MT Primary Storage r Stores data and program statements for the CPU î Data that have been input before being transferred to the ALU. î Data and results during intermediate stages of processing. î Data after processing until being transferred to an output device. î Program statements/instructions received from input devices and secondary storage. 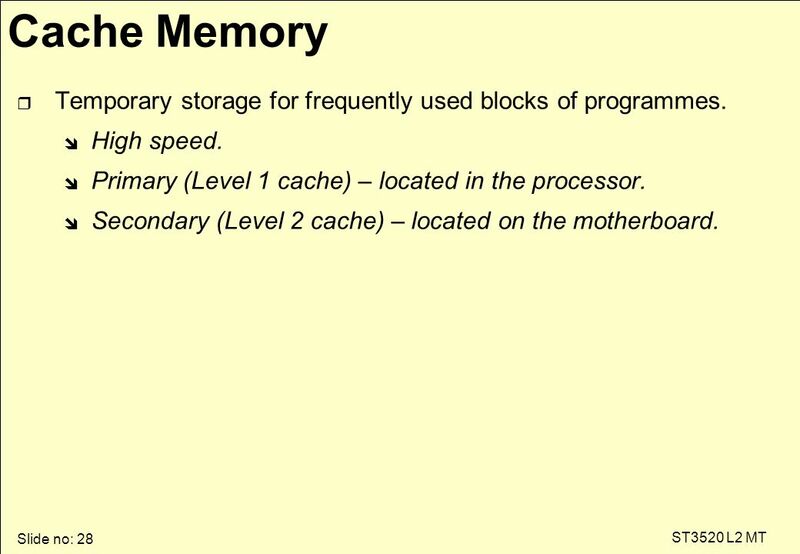 28 Slide no: 28 ST3520 L2 MT Cache Memory r Temporary storage for frequently used blocks of programmes. î High speed. 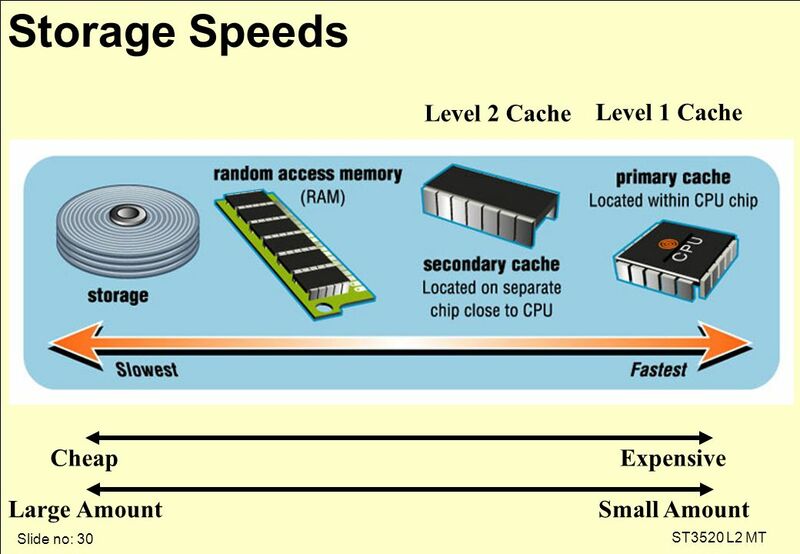 î Primary (Level 1 cache) – located in the processor. 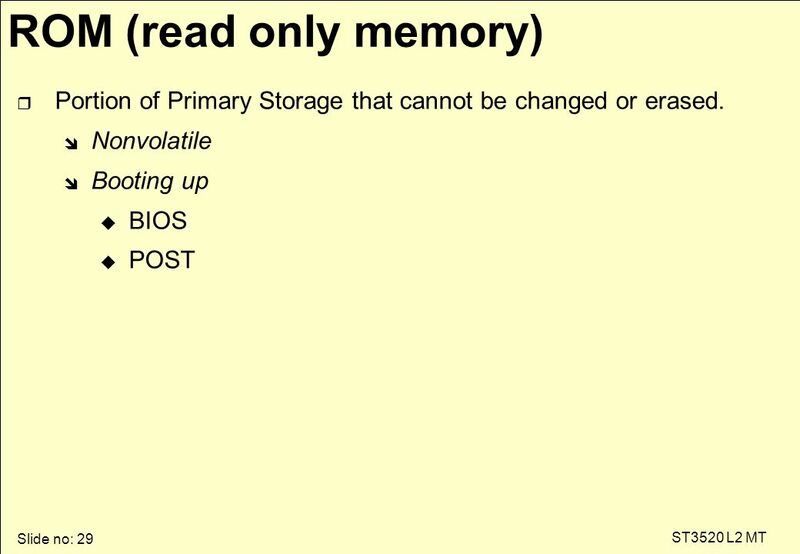 î Secondary (Level 2 cache) – located on the motherboard. 32 Slide no: 32 ST3520 L2 MT TO DO!! 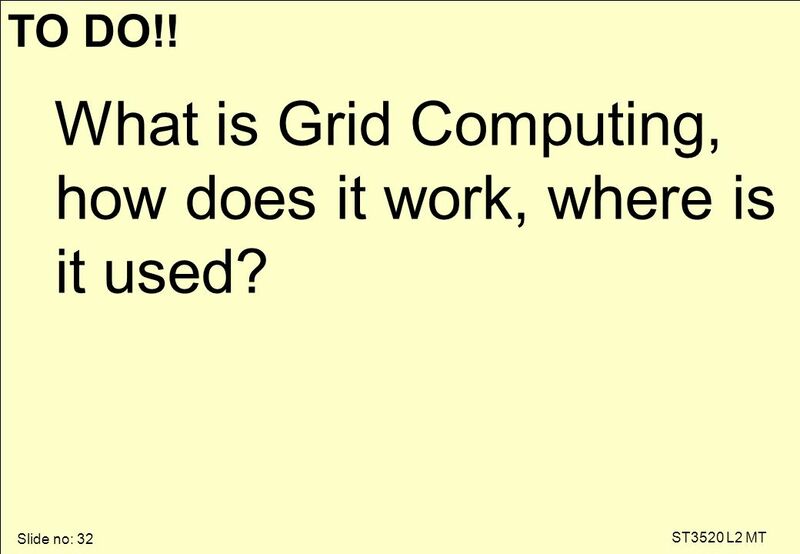 What is Grid Computing, how does it work, where is it used? 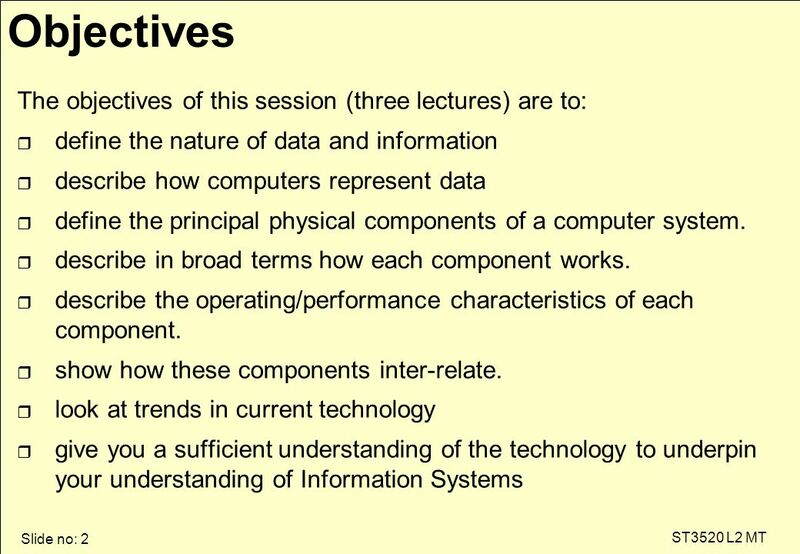 33 Slide no: 33 ST3520 L2 MT Summary of Key Points r Computers comprise input, output, storage and processing devices. 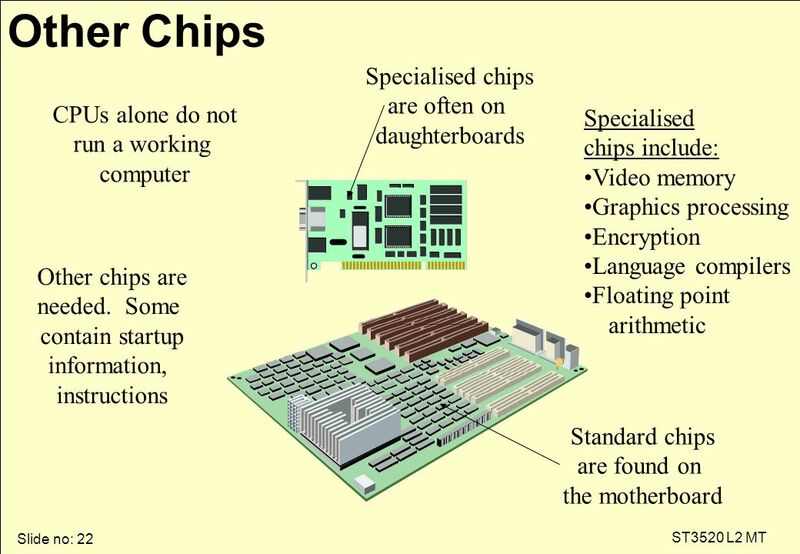 r Computers are made up of many components of which the most important is the Central Processing Unit. 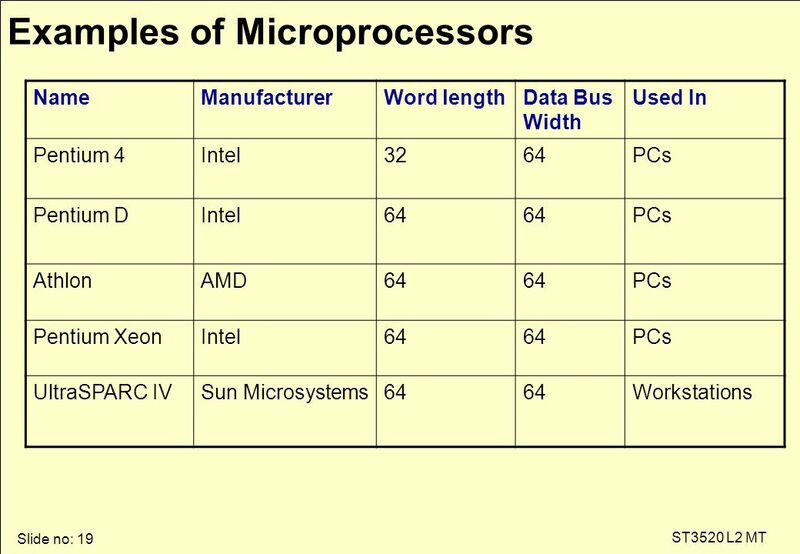 r Processor performance depends on: î Register size; î Clock speed; î Bus size; î Line width. 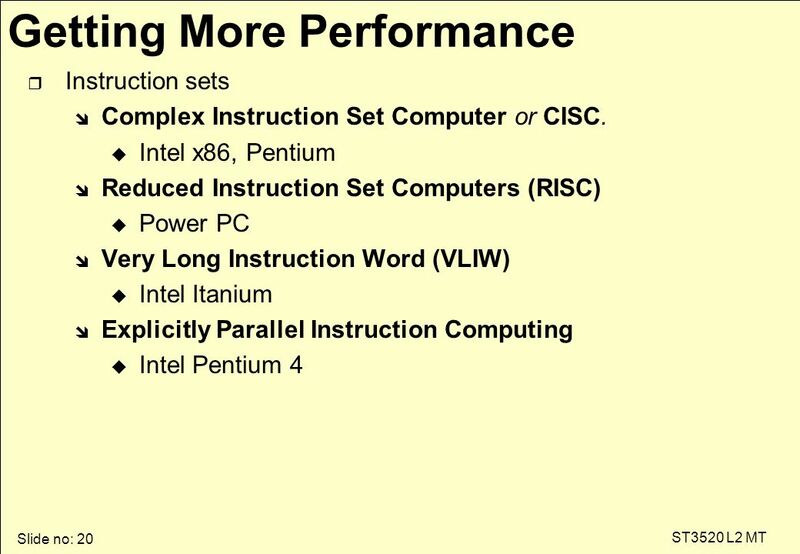 r Currently processors are mostly 64 bit. 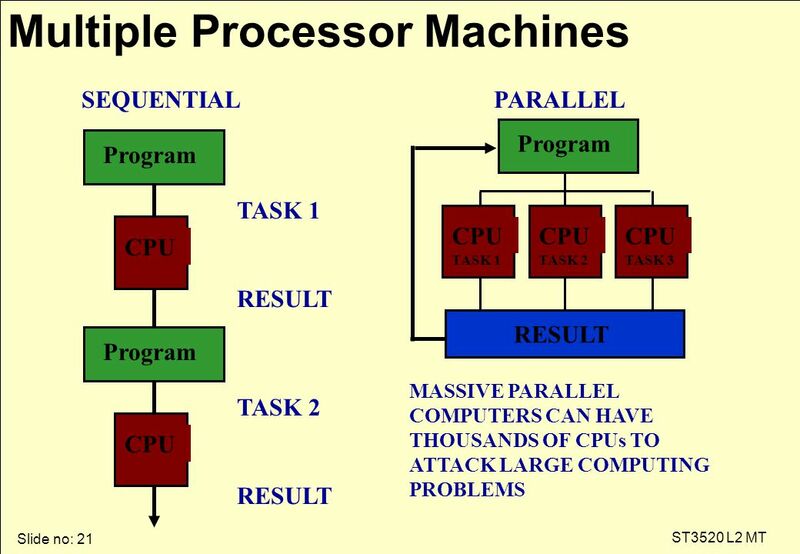 r There is a steady trend toward multiprocessing machines. 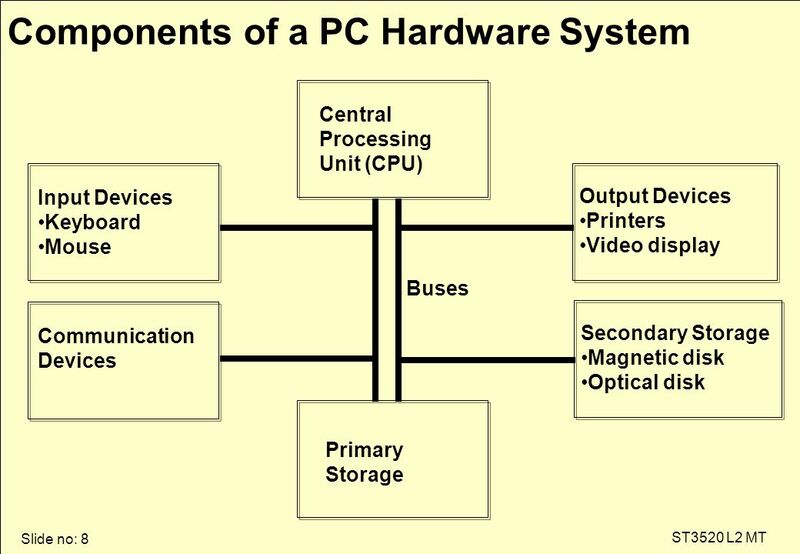 Download ppt "Slide no: 1 ST3520 L2 MT Hardware - 1: Components of a Computer." 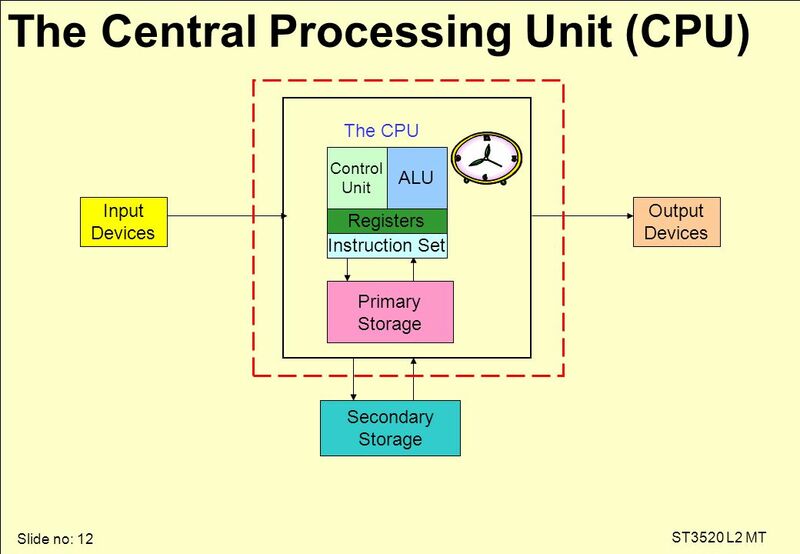 The Central Processing Unit: What Goes on Inside the Computer.  2002 Prentice Hall Hardware Basics: Inside The Box Chapter 2. 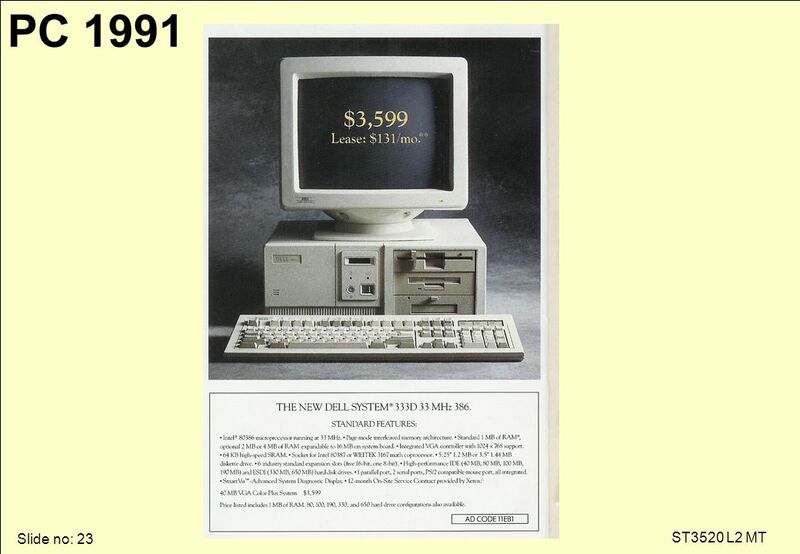 © 2014 by McGraw-Hill Education. This is proprietary material solely for authorized instructor use. Not authorized for sale or distribution in any manner. 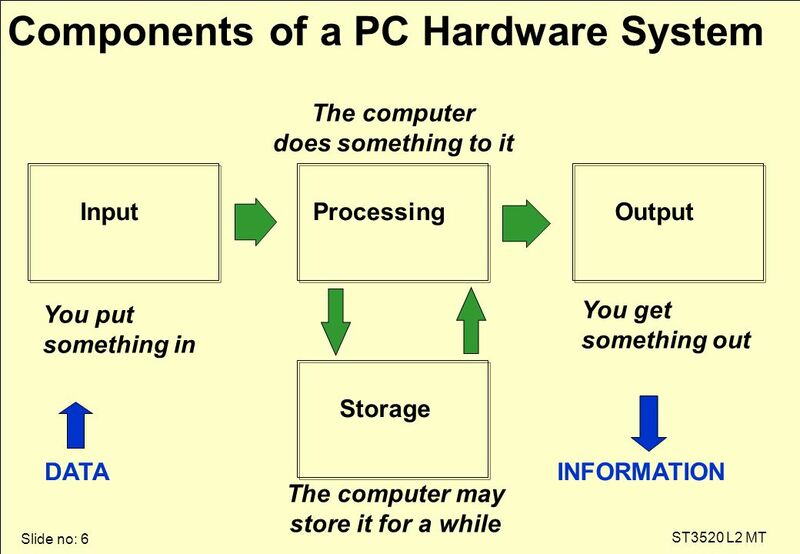 Computers Are Your Future © 2008 Prentice-Hall, Inc.
Hardware Basics: Inside the Box 2  2001 Prentice Hall2.2 Chapter Outline “There is no invention – only discovery.” Thomas J. Watson, Sr. What Computers. Computer Hardware Processing and Internal Memory. Chapter 4 The Central Processing Unit: What goes on Inside the Computer. 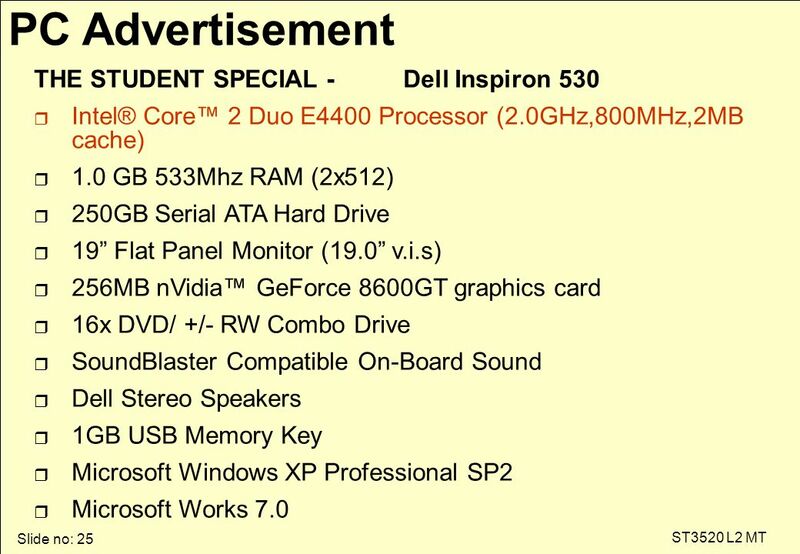 Computer Systems CS208. 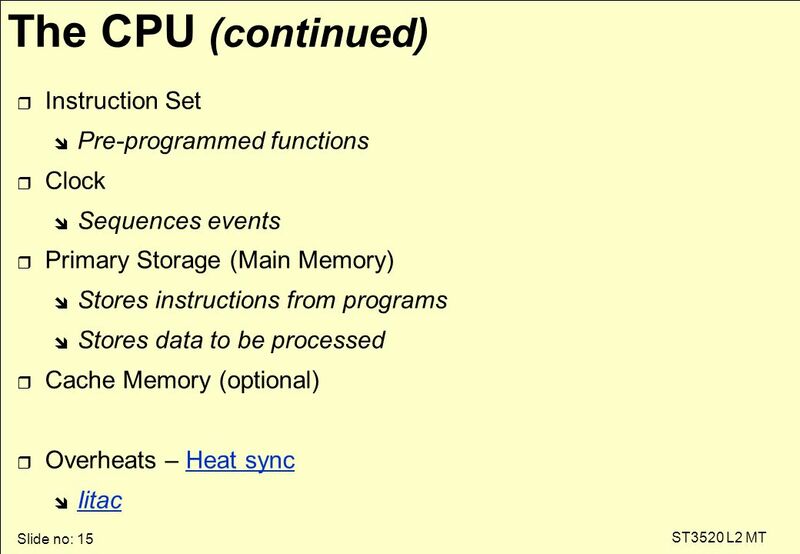 Major Components of a Computer System Processor (CPU) Runs program instructions Main Memory Storage for running programs and current. 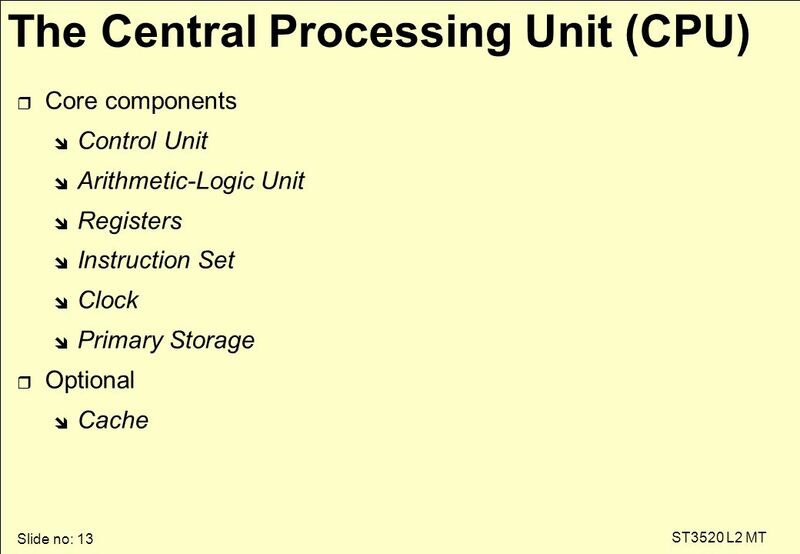 1 Chapter 4 The Central Processing Unit and Memory. Chapter 4  Converts data into information  Control center  Set of electronic circuitry that executes stored program instructions  Two parts ◦ Control. 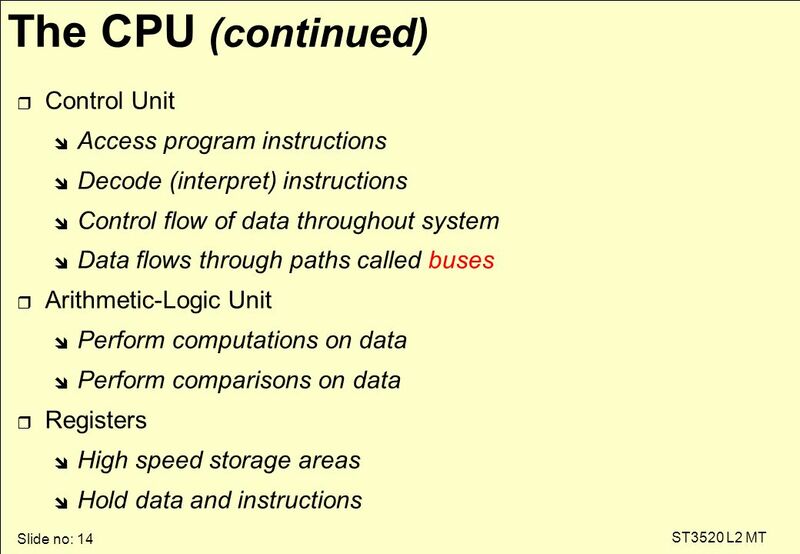 Computers organization & Assembly Language Chapter 0 INTRODUCTION TO COMPUTING Basic Concepts.